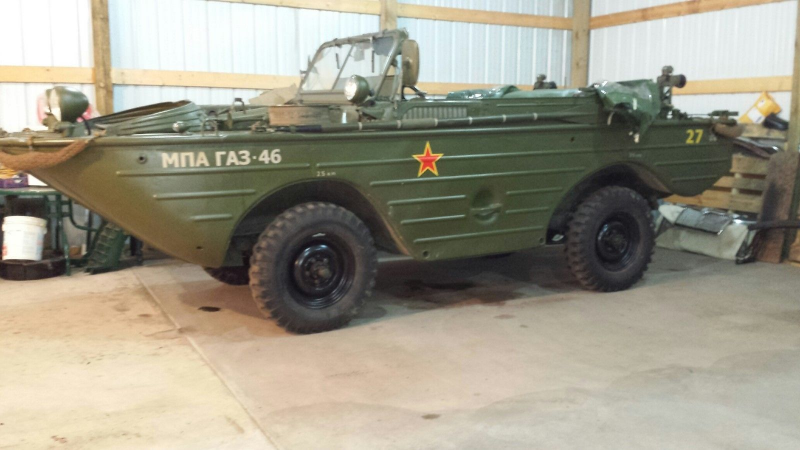 Russian GAZ-46 4X4 Amphibious Jeep. This Soviet vehicle is extremely rare and was manufactured from 1952 to 1955 and according to the GAZ factory records, only 654 of these vehicles were actually produced. Today, only about 65 are accounted for and only 36 or 37 are able to float. Only 4 are known to be located in the US. It was highly inspired by the US Army’s GPA, but is slightly larger and has a steeply sloped front and rear ends for ease in crossing the many rivers and lakes in Russia. This vehicle, like many, was professionally restored in Germany and the original, under powered engine was replaced with a Mercedes Benz OM-616 diesel engine, 4 speed transmission and power assisted brakes. For the “purists” the original engine and transmission are included. This vehicle is a great floater and has minimal leakage as the shaft seals are new and in great shape. There are 3 tops included, a rubberized canopy with windows, a tonneau like cover, and an original canvas top. Included also, is a new set of shaft seals, authentic oars, special black out lights and original combat split rims. It is believed to have a combat (bullet proof) spare tire which is extremely rare!! This vehicle was rated a Class 2 in the German GAZ 46 Association, Classic Data Report. As seen in the photos, this vehicle was on the cover and featured in the April 2011, Military Vehicles Magazine. A Bill of Sale, Bill of Lading and a German Title will be furnished. You can contact me through eBay messaging for more information and photos.